Mix the flour, salt and yeast in a bowl. Pour in the water, knead into a soft, smooth dough. Cover and leave to rise at room temperature for approx. 1½ hrs. until doubled in size. On a lightly floured surface, flatten the dough a little, first shape into a bun and then an oval loaf. Cover and leave to rise again at room temperature for approx. 30 mins. Line the base of the cooking pot with baking paper, cover with the lid and place in the lower half of a cold oven. Preheat the oven to 240°C. Score the dough crosswise with a sharp knife, transfer to the pot. Cover and bake for approx. 30 mins. in the lower half of an oven preheated to 240°C. Remove the lid, reduce the heat to 200°C and bake for a further 15 mins. 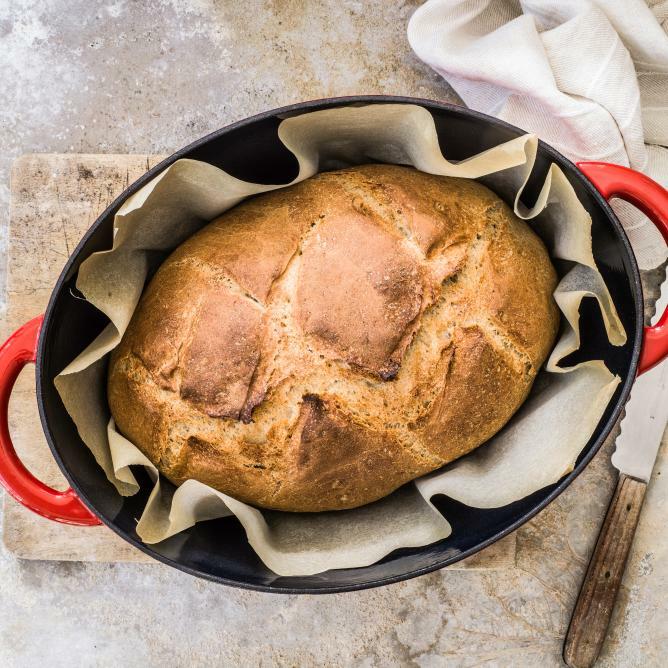 Remove the bread from the oven, leave to cool on a cooling rack. If the lid has a plastic knob, this must be removed. The hole can be covered with aluminium foil.